Set oven control to broil. Spray broiler pan rack with cooking spray. Mix egg product, milk, mustard, salt and pepper in medium bowl. Stir in bread crumbs and onion. Stir in beef. Shape mixture into 6 patties, each about 1/2 inch thick. Place patties on rack in broiler pan. Broil with tops of patties about 5 inches from heat 6 minutes. Turn, broil until meat thermometer inserted in center reads 160°, about 4 to 6 minutes longer. Serve patties in buns. “I love hamburgers and still eat them, but I buy the leanest beef available. 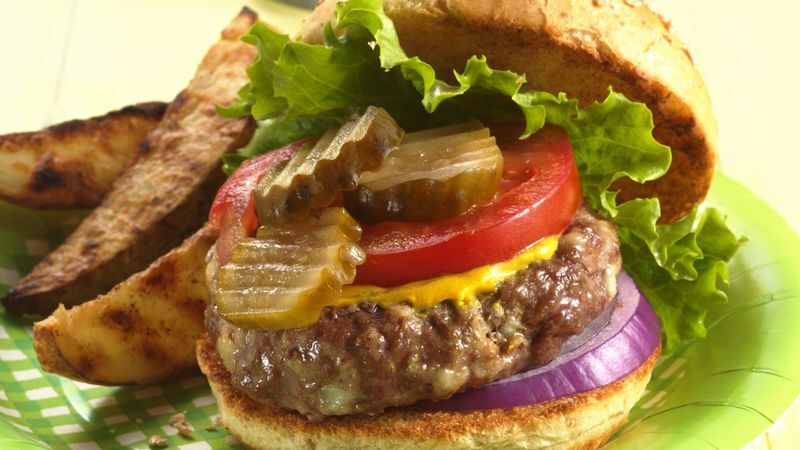 These burgers are great, because I like to use high-flavor ingredients like mustard or horseradish for an extra kick!” Nanci D.
These meaty sandwiches prove that the best burgers don't have to be loaded with fat and calories to be delicious! The place to pile it on is with the veggies: try lettuce leaves, sliced tomatoes, dill pickles, sliced onions or green peppers or your favorites and a little ketchup and mustard.